Thanksgiving is almost upon us (how can that be!? ), and it occurred to me that teachers are rarely honored during this time of giving thanks. I believe it should be the complete and total opposite. Teachers spend just about every waking moment of their lives planning for, caring for, worrying about, and teaching children. They deserve a little recognition this month. I keep thinking of a way we can spread the love for educators and thank them for all they do. They do SO much...not only for kids, but also for their colleagues, for the parents of children, and for our country. Do you know a fellow educator who you think needs a little recognition? Now's your chance! Beginning tonight through Friday, November 21, stop by Teaching With a Mountain View on Facebook so share some love for a teacher. It's easy. 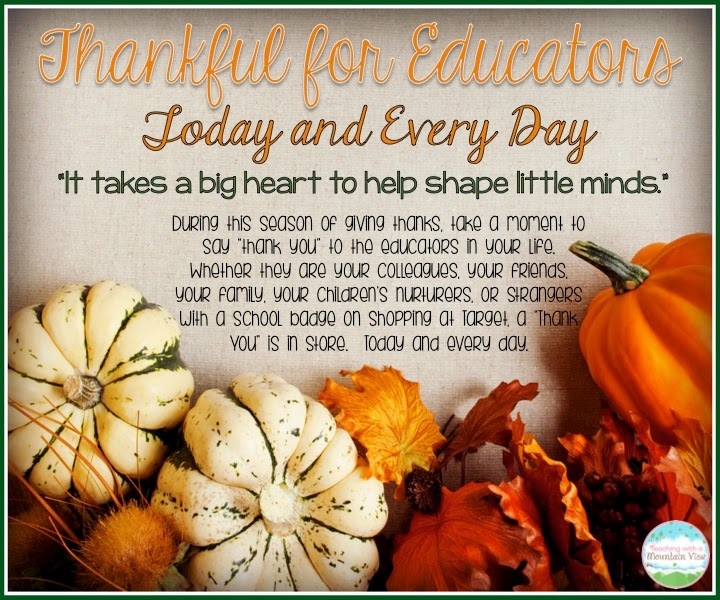 Just leave a comment where you tag a teacher friend (or just write their name if they are not on Facebook) and tell them why you are thankful for them. It doesn't have to be anything more than a sentence, but let's show the world just how amazing teachers are! And there's a tiny, little incentive for spreading the teacher love this week... I wish I could send a care package to each and every one of you. I will be sending out a care package to one educator who recognizes another on that Facebook thread. Inside that care package will be two identical goodie bags (one for the teacher who posted the comment and one for the teacher he or she recognized), filled with some of my favorite teaching essentials and some Teaching With a Mountain View goodies, too. There will be some chocolate involved, because every teacher needs a little chocolate to get through the next month... Already assembled task cards and Mr. Sketch markers are definitely included in the box. And there's one more thing included in the box that I should mention ahead of time...a $25 Teachers Pay Teachers Gift Certificate, graciously donated by my dad. He is grateful for all that teachers do and wanted to show his thanks. I thoughts this would be the perfect opportunity! I will leave the rest of the contents of the box a surprise for now. So, what are you waiting for? Hop over to my Facebook page and find the pinned post that has the image shown above. Add your comment noting who you a thankful for on that post. It is sure to make someone smile! Such a sweet idea! Very thoughtful of you! Did all teachers get such giveaway packages? Because my friend from Assignment Mountain didn't get any. Anyway thanks for amazing blog, very useful!